iTunes library getting too big and cluttered? 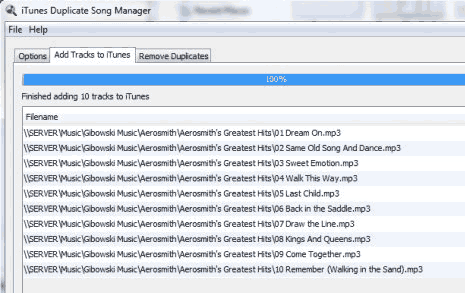 Well, its time to tidy up iTunes file listing by removing orphaned and duplicate files using iTunes Duplicate song manager. It is a free java based program to add tracks, remove duplicate and orphaned files. 1. Download iTunes Duplicate manager and unzip the file. 2. Double click iTunesDSM.jar file to launch the program. 3. Program window has 3 tabs to access basic functions: options, add tracks to iTunes and remove duplicates. This program requires iTunes XML file to pull the data. It will automatically find and load contents of iTunes XML file (in some cases you need to browse to exact location of iTunes XML file). Overall, it is a simple and effective program for iTunes files management on Windows based computer – try it!